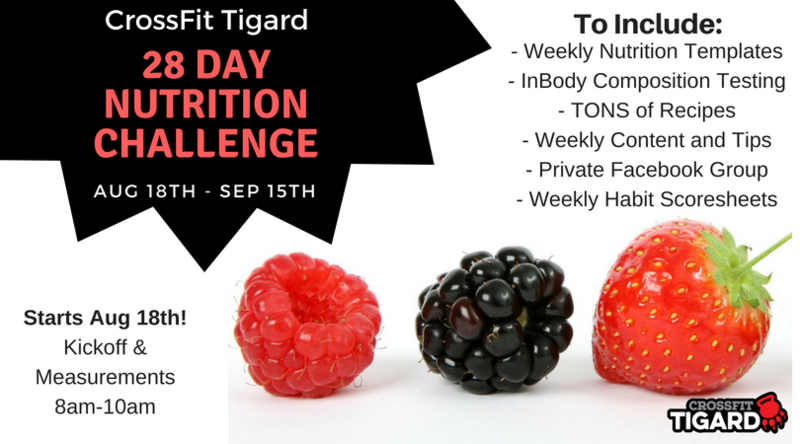 28 Day Nutrition Challenge - CrossFit Tigard P.A.W. Challenge Nutrition Class — Learn Nutrition Basics from Our Nutrition Experts. Weekly Meal Planning Templates — Take the guess work out of what to eat by following our 6-week meal plan-complete with grocery lists, recipes, and more great info. Before/After Measurements — Precisely measure your changes in bodyfat and muscle mass with before/after InBody Body Composition Measures. Support Group — Stay motivated in our Private Challenge Facebook Group. Weekly Videos and Tips — Pick up new knowledge and habits with our weekly emails, tips, videos, and updates. Habit Tracking — Track your healthy habits with our daily score sheets–get points for exercise, planning meals, recovery and good health habits.